Sometime late last year, we ordered a new sofa for the flat. The old one was a godawful suede thing which made the concrete floor comfortable. 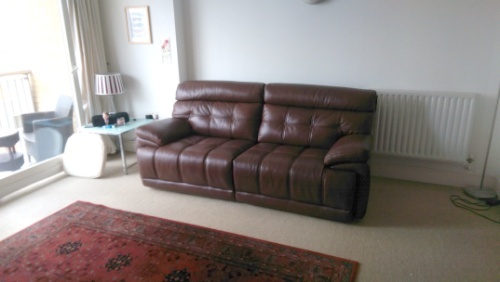 It came with the flat and, once covered with cushions and a throw, was almost bearable to look at – no amount of anything would ever make it bearable to sit on. Anyway, Mirinda has been threatening to replace it almost since we bought the place and, finally, late last year, she did. However, like all good things, it took ages to make and then deliver it. Today, in fact, was the day it was being delivered and, or being a book group day, mum and I set off for Canary Wharf to meet Victor and his Schumanian side kick as they huffed, puffed and generally struggled getting the new one up to the flat. I have to say that it looks mighty smart. It also reclines – both sides, independently – and it’s very comfortable. I know this because I sprawled out on it to listen to the Archers. 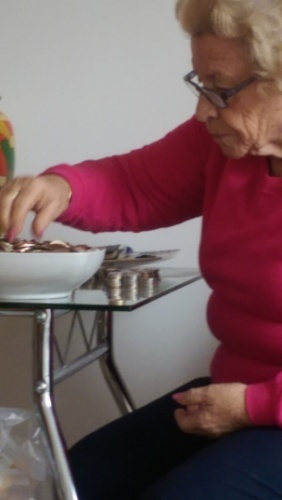 Of course my day was spent in cleaning the flat while mum counted the change in the biscuit tin and made a start on the very deep and ridiculously heavy fruit bowl. We left at around 3, in order to beat the rush hour clowns and were very fortunate in getting a lift home from the station from Mirinda. I made Middle Eastern meatballs with tagliatelle for dinner and we watched a couple of episodes of Dickensian which, we discovered, has another 11 episodes to go. This annoyed mum because she’ll not see the end if it before she goes back home.